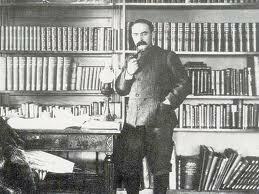 The tenth in my ongoing series examining the poetry of Rudyard Kipling. The other posts in the series may be read here, here , here , here, here , here ,here, here and here. Rudyard Kipling had an intensely ambivalent attitude towards America and Americans. His wife was an American and he and she after their marriage resided in Vermont from 1892-1896. The Kiplings loved Vermont, Rudyard Kipling especially loving the rugged natural beauty of the Green Mountain State. but eventually returned to England due to a now forgotten diplomatic squabble between the US and Great Britain over the boundary between Venezuela and British Guiana and which led to the last talk of war between those two nations, and a family squabble involving some of Kipling’s wife’s relatives. America means freedom and there’s no expression of freedom quite so sincere as music. The show What’s My Line makes a rather good time capsule for informal looks at major figures in mid twentieth century American history. On February 19, 1956 General Mark Clark, commander of the US Fifth Army in the Italian campaign during World War II, and commander of the United Nations forces in Korea from May 12, 1952 to the truce ending the conflict, appeared on the show. The largest city of the Confederacy, New Orleans also controlled all shipment from the Mississippi and into the Mississppi. Even a cursory look at a map would indicate that New Orleans was a crucial city for the Confederacy and a crucial target for the Union. In early 1862 the Union assembled a force to take this prize: 18,000 soldiers commanded by Major General Benjamin Butler, and a naval armada under Flag Captain David G. Farragut, 6o years old, but possessed of energy that few men in their twenties possess, and a veteran of over half a century of service in the Navy. In Mid-March Farragut began moving his fleet into the mouth of the Mississippi. 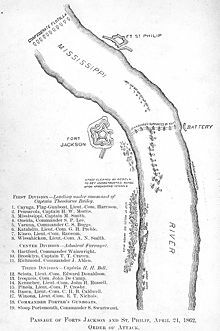 The approach to New Orleans up the Mississippi was guarded by two Confederate forts: Jackson on the west bank and Saint Philip on the east bank. The Confederate defenses were aided on the river by three ironclads: the CSS Manassas, the CSS Mississippi, and the CSS Louisiana, backed up by an improvised fleet of converted merchant vessels, gunboats and rams, none of which stood any chance against the might of the Union fleet. If Farragut’s force was going to be stopped, it would have to be by the forts. From April 18-April 23 the forts were bombarded by 26 mortar schooners under the command of Farragut’s foster brother Captain David Porter, with whom Farragut had an uneasy relationship. Porter had used his influence in Washington to require Farragut to give him the chance to reduce the forts by bombardment. Farragut was sceptical and he was right. Although the bombardment was fierce, the forts remained in action. On the 24th, Farragut successfully had his ships run past the forts, destroying the Confederate fleet in the process. Almost defenseless New Orleans surrendered to the fleet after three days of negotiation on April 29. Butler’s army took the forts bloodlessly on the 29th, aided by a mutiny of the Confederate troops at Fort Jackson. The richest strategic prize of the War fell to the Union swiftly, and with amazingly few casualties. Farragut was promoted to Rear Admiral for this feat, the first admiral in US history. The Union took a large step to victory with the fall of the Crescent City. Bring Back the Draft? A Look at the American Experience With Conscription. I have misused the king’s press damnably. I have got, in exchange of a hundred and fifty soldiers, three hundred and odd pounds. I press me none but good house-holders, yeoman’s sons; inquire me out contracted bachelors, such as had been asked twice on the banns; such a commodity of warm slaves, as had as lieve hear the devil as a drum; such as fear the report of a caliver worse than a struck fowl or a hurt wild-duck. Former Washington Post Reporter Thomas Ricks, who now works for the liberal Center for a New American Security, a think tank focusing on defense issues and which has provided several top personnel in Defense slots for the Obama administration, thinks that it is now time to bring back the Draft. He proposes it not because he believes that the Draft would improve the military, but because he believes that it would make the nation less likely to go to war. Jonah Goldberg has a great column in which he takes apart the myth of the Social Darwinists. Meanwhile, the myth that Social Darwinism was a popular term in the late 19th and early 20th centuries was largely created by the liberal historian Richard Hofstadter, whose 1944 book Social Darwinism in American Thought didn’t merely transform our understanding of the Gilded Age, it largely fabricated an alternative history of it. Something for the weekend. Pat Murphy of the Irish Brigade sung by Bobby Horton, who has waged a one man crusade to bring Civil War music to modern audiences. Immigrants, especially Irish and German, were a mainstay of the Army of the Potomac, and wherever you have Irish fighting you are going to have Irish songs about the fighting.